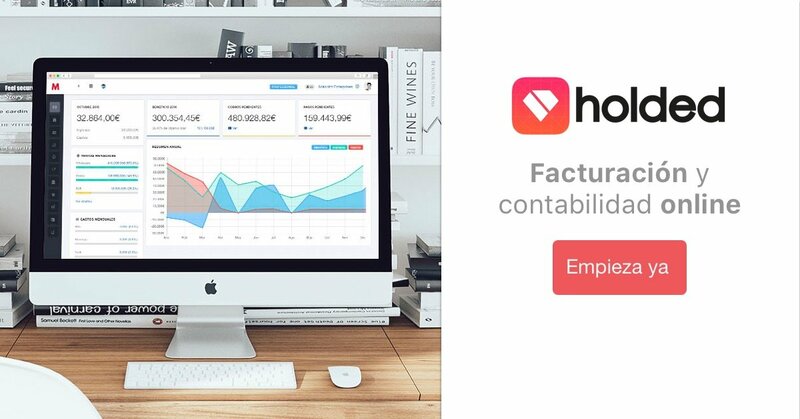 PHP applications usually have a configuration file such as config.php or similar in which you probably can find database user and password if you don’t remember them or if your customer has not provided you with this information. If you don’t have sufficient permissions to create the subdirectory where your backup files will be stored (by default myphp-backup-files/), you can use an existing directory. PHP applications usually have some subdirectory with enough permissions to create new files (cache, tmp, temp, etc. ), which is where you will tell myphp-backup.php script to leave the file with the database backup. You can also use the root directory itself (DocumentRoot). To do this, simply assign a point (‘.’) to the BACKUP_DIR constant. The previous file will contain compressed (or not) SQL code ready to restore the structure and content of the original database in another database or in the same one but replacing the existing data with those of your backup file. To perform the restoration you will simply run the other script in my repository: myphp-restore.php. The only thing you will have to do to perform the restoration is to upload both the myphp-restore.php script and the backup file itself to a folder in which you have write permissions on the server where you want to import data and run it through your browser (http://www.example.com/myphp-restore.php) or from command line. Don’t forget to set backup file and folder names before using the BACKUP_FILE and BACKUP_DIR constants. The script will automatically detect whether the backup file is compressed with gzip or not based on the .gz extension, so you don’t have to make any additional settings for this. 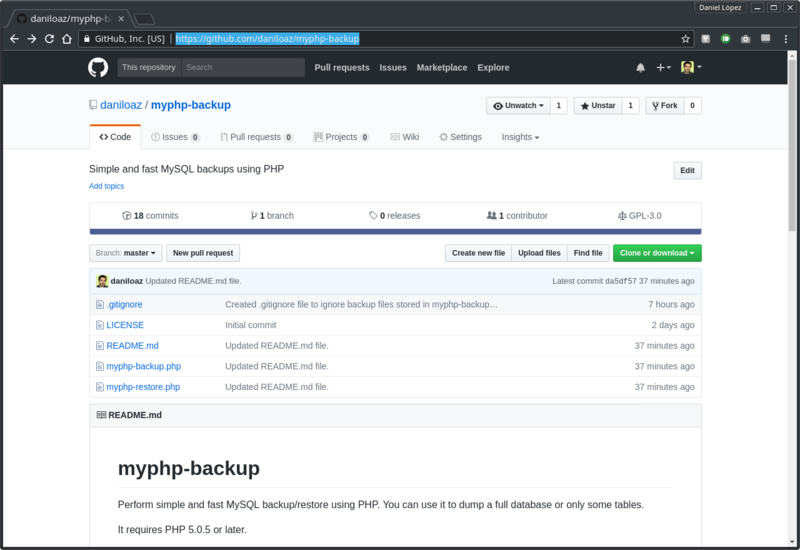 You can find the source code for both backup and restoration scripts in my Github daniloaz/myphp-backup repository at https://github.com/daniloaz/myphp-backup. And nothing else. If you can think of any additional feature that you miss and might be useful for you or other users, don’t hesitate to leave a comment. Good luck! I can not understand why! is true, in fact I checked the tables and had a few problems. Thank you! The problem occurs only on a server where I run the script. I hope can help someone who has had the same problem! Yes, it’s true. When a table name matches an internal command of MySQL, the script fails to export that table. This is solved as you say adding ` and ` before and after the name of the table. Thank you very much for your clarification! It seems very interesting. I will examine it more closely. Thanks for your input! Thanks men, the only code what i find and works!!! ereg_replace() function is deprectaded in PHP 5.3. Sorry, I should update the script. In the mean time, you can avoid this problem just replacing calls to ereg_replace() function with preg_replace(), wich have the same syntax than ereg_replace and works properly in PHP 5.3.
the preg_replace functions is not working everything is blank and not fild in backup file..
have you the script for restore ? $ mysql -u db_user -p db_name < db-backup-db_name-20120807111744.sqldb-backup-db_name-20120807111744.sql is the resulting file from the above script excution. thanks for the codes.. but i m having the error “Deprecated: Function ereg_replace() is deprecated in C:wampwwwTry123 – ORIGINAL – WITHOUT SUB-CATEGORYtry123.in.datap18.php on line 133”. Please, check comment #5 in this thread. Is there anyway i can gzip the sql file and save? Hi John, have a look to the first comment in this thread and subsequent replies and you will be able to fix that warning. Spent some time updating the script so it runs without warnings on younger installs. Great script, but when I was backing up my Magento DB it seems to be “sort of a timed out”. After a couple tries it gets “stuck” without any error report on the table “report_event”. On small databases the script works great, but do you have any tips how I can let the session last longer so it can finish the whole DB backup? Perfectly made script – but it fails with big databases (with tables over 10k rows). Needs adaptation useing data splitting to chunks for both MySQL queries (… LIMIT , ) and file writing – otherwise you will get either “<ySQL client is out of memory" or null-sized dump files. I had an old Joomla website with only FTP access and I was able to backup the whole database. thanks for the perfect script! It worked perfect for 2 wordpress sites and one joomla. Thanks! But the script is still far from perfect. In fact, the problem you mentioned is due to script’s wrong interpretation of the reserved word OPTION, wich is the same name you used for your table. Use an alternative name for your table (using a custom prefix is always a good idea), or quote the table name. Hope this helps! where is the export database ?? thanks a million.. works great! Thank you very much. Your script is very effective. Hi Danilo, thanks for the script. I have a problem with preg_replace function. Simple and effective. Thanks so much Daniel. Hi how again do i use your backup script for a restore script?? where is the line i need to replace? Thanks for the script, just what i’ve been looking for! I’ve executed the PHP script and got the “Backup result: OK” message but i cant find the resulting SQL file? Where would I need to look for it? Backup destination is set using the OUTPUT_DIR constant defined at the the beginning of the script. In my case I set the cache directory, but this directory does’t have to exist in all installations where you run the script. Therefore, you should define a directory that is valid in your particular case, or not directory at all and let the script to save the file in your webroot directory. very Nice script for database backup. but my table in 48698 records that time this script can’t take backup. third_party_review_data table in 48698 records therefor can’t take backup. any suggestion for get big database table backup. But how to make my browser auto download the file ? for your script. That run very well! Also, for some reason, I have changed the * to a specific table name, yet it somehow export all tables in the database. I can’t see why this happens? Hi! Thanks for posting this. I tried this script and did some modification because I’m using mysqli. I can now have the sql backup file but when I open it, the values in every table are all “0”. (e.g. INSERT INTO info VALUES(“0″,”0″,”0″,”0″,”0″,”0″,”0″,”0″,”0″,”0″,”0″,”0″,”0″,”0″,”0″,”0″,”0″,”0″,”0″,”0″,”0″,”0″,”0”); ) How am I going to fix it? Hoping for you assistance. Thanks. I have changed the ereg_replace function with preg_replace but its not goes fine. Help me to make this happen. i want to get database backup automatically using php code for windows. i have wamp server , win7 os , mysql. Can you give me proper php code for this. Hi, this ready correctly for version PHP 5.5, change to new msqli. it works great, thank you man. DROP TABLE IF EXISTS table_name; in sql file. But showing Backing table is OK for all the tables. Please advise. thank you. The backup file is created, first two lines written and that’s all. What could be the problem? It can use MYSQLi and PDO. thank you. awesome script 🙂 help me a LOT. When i run this script it generate message OK OK but i am not able to find where it store files. I am using ubuntu. Thanks Joshy Francis, this feature is already implemented. Awesome it was very usefull …. thankyou so much…. Thanks kintu micheal! Now it’s fixed. It depends on the file system in which the two files are stored. The same file can be of different size on two different file systems. You can download it again after upload and perform a diff. There shouldn’t be any difference between them. awesome.. it was very useful when a rogue developer did not give access to the host. Kudos to Daniel for writing this..
i want to take back up (export) tables from the database in local system(it should ask where to store these files) or the path (another drive). And in case of import the table it should take files from local drive or which i have to choose. I am using CentOS. So, please let me know, how to do this…. You only have to set the BACKUP_DIR constant at the beginning of either the backup or restore script with the proper directory where you want the backup files to be created or read. It works great, thank you Daniel ! The error does not affect the script running or generating the backups, so this might be a false positive! Is it something I can fix on my own!? Thanks Seul, I added a check before performing ob_flush() to prevent “ob_flush(): failed to flush buffer. No buffer to flush.” errors. I think you shouldn’t have that problem again. Hey, I have one question . Is this possible to use all codes within a single function?? I just want to merge backup and restore files in a sinle file . Problem I’m facing is I’m unable to call a function for post method ( I’m using manual inputs) . Can you clarify me this ? 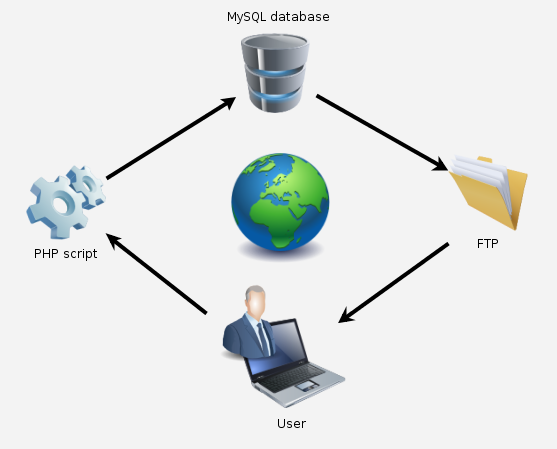 You have to upload both the restoration script and the SQL file to the remote server via FTP or similar, and then run the first one pointing to http://www.example.com/myphp-restore.php using your browser. Exactly what I’ve been searching for and failing to find! I kept running out of memory, thank you very much!